ACDSee Pro 5.3.168 Free Download - ACDSee Pro 5. Total photography control. ACDSee Pro 5. Total photography control. Last Updated: 8/9/2012 | File Size: 70598 KB | Price: $239.99 | Downloads: 248 | Developer: ACD Systems International Inc.
ACDSee Pro 5. Total photography control.Achieve total control of your photography workflow and get back behind the lens faster with ACDSee Pro 5, the complete photography management solution for professional photographers. Build your photography workflow around ACDSee Pro 5 see why its flexible cataloging capabilities, unrivalled viewing speed, powerful RAW processing and advanced editing tools make ADCSee Pro the choice of photographers worldwide. 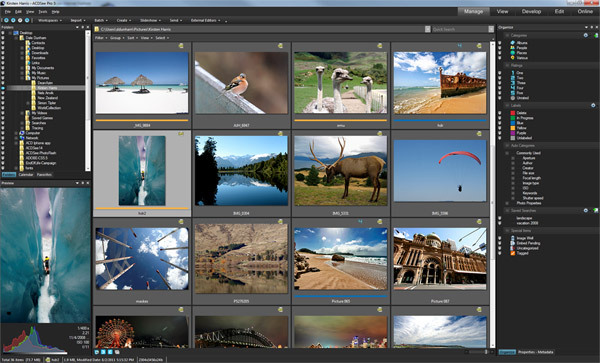 Add vastly improved RAW processing, a full set of metadata tools, patented LCE single exposure HDR technology, and unparalleled viewing speed, and you have a fully integrated photography editing and management solution. ACDSee Pro 5 accelerates your workflow and quickly gets you back to doing what you do best: shooting amazing photographs. Statement: First, please download the orginal installation package by clicking the download link. Of course you may also download it from the publisher's website. Using ACDSee Pro crack, key, patch, serial number, registration code, keygen is illegal. The download file hosted at publisher website. We do not provide any download link points to Rapidshare, Hotfile, Depositfiles, Mediafire, Filefactory, etc. or obtained from file sharing programs such as Limewire, Kazaa, Imesh, Ares, BearShare, BitTorrent, WinMX etc. Software piracy is theft. If you like ACDSee Pro please buy it.